Last weekend I went ahead and did something I never thought I'd do: the Mud Hero race down in Red Deer. Mud Hero, for those of you who are blissfully unaware, is a crazy obstacle course/race/endurance sport/mud bath and spa/general day of chaos that follows in the ever-growing trend of mud runs for the athletically-inclined. There are dozens of similar events to this around Canada each summer, and the Mud Hero appears to be one of the most popular with over twelve thousand participants over the three days of heroing in Red Deer last weekend. The event attracted people from all backgrounds and fitness levels, and has likely inspired wonderful stories of perseverance, raising money for charity, and teamwork through adversity. To all this, I say nonsense. The most interesting part of the Mud Hero is the statistics, and, much as though readers of this have likely figured out already, the inescapable conclusion that Mud Heroes just aren't normal. 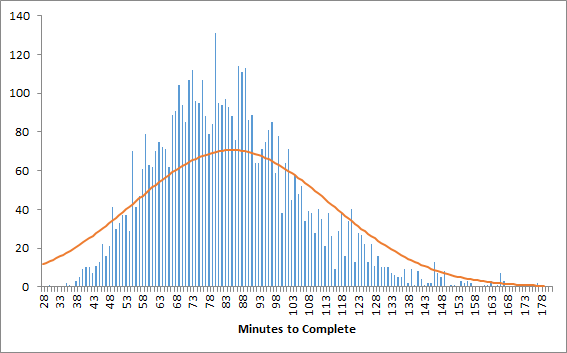 Right off the bat that may look quite like a normally-distributed bell curve - there's certainly a lovely peak right around the middle, and it tends to taper off at either end. The reported average time for the course was 1:25:22 (85 minutes), and that seems to be reasonably around the middle of the peak. That's not really all that close at all. These are two bell curves that have the same mean and standard deviation, but are not identical, leading to the fun conclusion that Mud Hero runners are not normal (well, normally-distributed at least). Mud Heroes tend to be positively skewed (the mean is higher than the median), and have shorter and bounded tails. This isn't really all that surprising - in fact a normal distribution would have been surprising as there are necessarily cut-offs to the data (nobody can do the race faster than 0 minutes, for instance), and it was a relatively short race. Often people tend to view all bell-shaped curves as normally-distributed, even though there are an incredible amount and diversity of probability distributions out there. So Mud Heroes aren't normal. What else can we learn from the data? 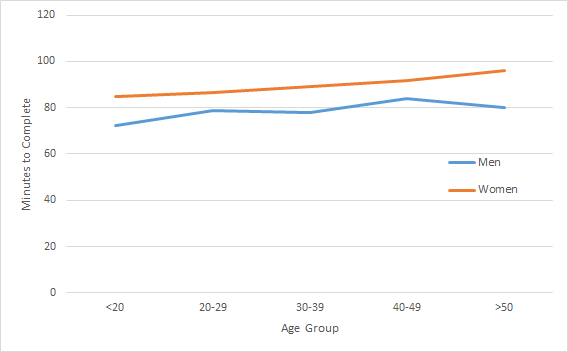 Fortunately the results are broken down into genders, ages, and hometowns, so let's look at those! Turns out there's no reasonable statistical difference between participants from Red Deer, Calgary, and Edmonton. 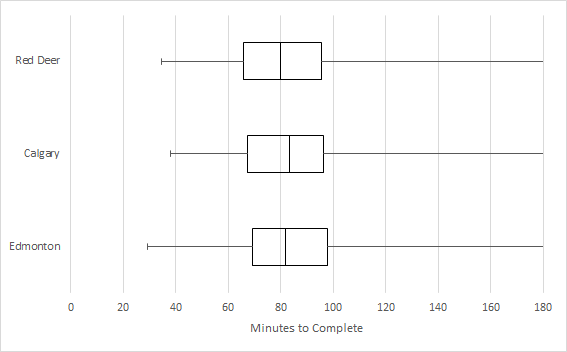 These box plots for their results suggest they have almost identical distributions for time, and an ANOVA test suggests that they can all be considered to be drawn from the same population. 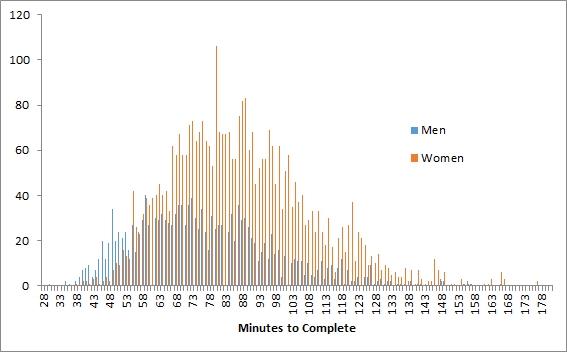 So really, even though the average time for Calgarian Heroes was two minutes faster than Edmontonian heroes, it's not significant enough for them to brag. So ha! All in all though, Mud Hero was definitely a fun experience. If you're looking for a good excuse to get tired and muddy, I'd highly recommend it for next year!